A First Century Church in Jordan? A Video of Two Angels Taking A Soul? Why are Ethnic Russians Converting to Islam? Having been born and raised in Boston, there was once a time when I was about twenty years old that I lost my appreciation for this great city. In hindsight I look at that feeling as just an inner need to escape the environment I was living in and take in a new experience, both physically and mentally. I was in college at the time and had no chance of physical escape, so I realized I had to make an intellectual transformation of how I perceived Boston. My solution in accomplishing this was to devour what Boston had to offer that entire summer like an educated tourist and take in its amazing history through things like books, tours and excursions. That experience and intellectual broadening has transformed my thinking and to this day I sincerely appreciate and adore the city of Boston and after all my travels truly think it is the among the best cities of the United States. "Saint Botolph was born in England around 610. In his youth he became a monk in Gaul. By 654 he had returned to England and founded the Monastery of Ikanhoe in East Anglia. Thereafter, the place came to be called 'Botolphston' (from either 'Botolph's stone' or 'Botolph's town'), which was later contracted to 'Boston'. Having led many in the way of salvation, and renowned for his sanctity and miracles, Saint Botolph reposed around the year 680. He was greatly revered by his Christian countrymen in antiquity, and is commemorated to this day in the name of two cities, both the original Boston in the Lincolnshire fens (about 100 miles north of London), and likewise its namesake in the New World, in Massachusetts. The feast of St. Botolph is celebrated June 17." I was just about drop-jawed when I found out that the city I was born and raised in was named after an Orthodox Saint, and even more pleased the monks had written hymns for Saint Botolph as well (see below). This was information they certainly did not teach me in school, and it was a discovery that literally transformed how I viewed Boston and prompted me to do further research. One day soon after this discovery, while driving through Boston along Massachusetts Avenue, I noticed that the street running parallel to Huntington Avenue was named St. Botolph Street. Though there is no church dedicated to Saint Botolph on this street, I did discover later on, besides the fact there is an apartment complex named after Saint Botolph, that on Huntington Avenue itself there is a YMCA with an Anglican chapel inside dedicated to Saint Botolph. Besides this there are few other mentions of Saint Botolph in the city of Boston (there is a club named after him, and the house of the president of the Jesuit-founded Boston College is also named after the Saint). Noteworthy is the fact that pieces of the Gothic window tracery of Lincolnshire’s Church of St. Botolph are incorporated into the structure of Trinity Church in Boston’s Copley Square. One thing I was pleased to discover however was that the Orthodox are slowly laying claim to their Saint in the hopes of sanctifying their city in the New World, as is traditionally done in the more Orthodox countries of the East. Besides the awareness Holy Transfiguration Monastery is promoting through their icon of Saint Botolph, there is also a Russian Orthodox Church Abroad parish in Roslindale named after Holy Epiphany that depicts an icon of Saint Botolph (painted by parishioner Zoya Shcheglov) on its south wall facing towards the city in full stature and giving blessing to the city that bears his name. 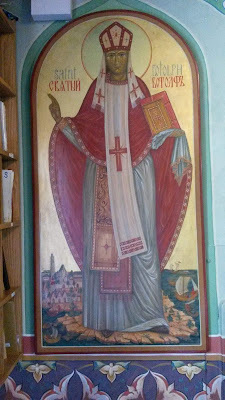 Unfortunately there is no Orthodox church or chapel dedicated to Saint Botolph in Boston as of yet, but there is an Antiochian Orthodox Church dedicated to Saint Botolph in London. In my research regarding the figure of Saint Boltoph and the relationship between the two Bostons, this is what I discovered. The Rev. William Blackstone was the first settler of the area that would come to be known as Boston. He was an Anglican priest who fled England due to his disagreements with the Church of England and joined the Gorges expedition to the New World in 1623. After most from the expedition returned home, Blackstone decided to live as a recluse in the heavily forested area of what we know today as Boston Common and Beacon Hill in 1625. He is said to have had the largest library in the colonies at that time and just wanted to live alone with his books, his cattle, and his gardens. In 1629 Puritans arrived in Salem but then traveled to nearby Charlestown from a place in England called Boston in Lincolnshire. The area that Blackstone lived in was originally called Shawmut by the local Indians and Trimountaine by the colonists due to the fact that the area consisted of three hills (this is how Tremont Street got its name). In 1630 Blackstone invited the Puritans to make their settlement across the Charles River on the Shawmut Peninsula with him since they had problems with clean water in Charlestown. 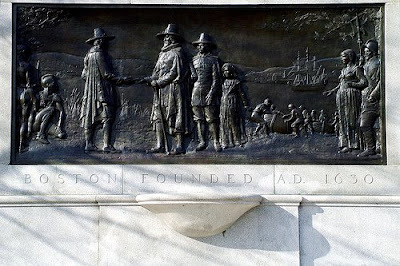 On September 17, 1630 their new settlement was renamed Boston with the proclamation of John Winthrop, "that Trimountaine shall be called Boston", after their hometown in England, and it was designated the capital of the Massachusetts Bay Colony. These Puritans were an intolerant group in their zeal to have a pure Church in the New World. When they settled in Boston they granted Blackstone 50 acres of his own land. However they looked upon him with suspicion since he was an ordained minister of the Church of England and the Puritans feared he would try to establish the Church of England in the Massachusetts Bay Colony. The Puritan court thus ordered his house be burned. This display of intolerance forced Blackstone to move 35 miles south and settle in Cumberland, Rhode Island. They also had Anne Hutchinson exiled to Rhode Island in 1638 as well for similar intolerance. 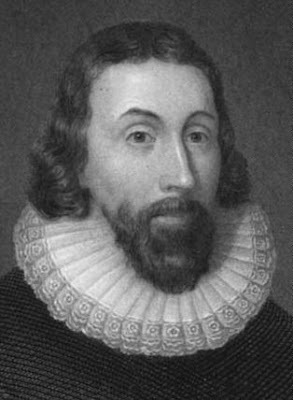 John Winthrop was the first governor of the Massachusetts Bay Colony and he is famous for delivering his famous sermon titled "A Model of Christian Charity" in 1630 while still aboard the ship Arbella. This sermon contained the famous phrase "city upon a hill" when Winthrop warned the settlers that they were being watched by the world and needed to be an example of pure Christian conduct. It was his hope to build a model Christian community in the Massachusettss Bay Colony free from the corruption of the Church of England and thus be an example to the Protestants in Europe and reform the Church of England which had corrupted itself with Catholic practices. Soon after the Puritan settlement in Boston, it became the largest and most influential city in the New World till the mid-18th century. America's first public school, Boston Latin, was founded in 1635 and its first college, Harvard, was established a year later. Boston Latin was modeled after Boston Grammar School in Lincolnshire. Rev. 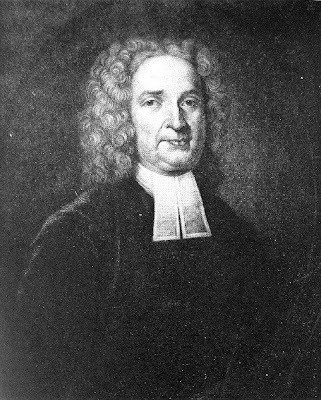 John Cotton eventually came to Boston with his family in 1633 to serve as the "Teacher" in what is now the old First Church in Boston’s Back Bay. During the remaining 19 years of his life, Cotton was the “senior statesman” of the Church as it quickly spread with the Massachusetts colony along the shores of northern New England. He served as an arbiter of theologi­cal controversy and largely defined the characteristics of what became New England Congregationalism. He was also the grandfather of Cotton Mather who would play an important role in the Salem Witch Trials. John Cotton is an under-recognized figure in history. It was he who lit the flame that motivated the colony of Massachusetts Bay, and more than any other single individual defined the society that became New England. Back in England John Cotton had served in Boston as the vicar of Saint Botolph's Church from which many of the Puritan settlers had also come and knew of this charismatic minister. He had served at Saint Botolph's from 1612 and was widely regarded as the preeminent Puritan theologian in all of England. Cotton would draw large crowds to Saint Botolph's from throughout all of England to hear him deliver one of his legendary three-hour sermons. In fact, the pulpit raised in the church for John Cotton in 1612 is still in use today. When Archbishop Laud chastised Cotton for serving the sacrament to people standing instead of kneeling, Cotton replied there was no room for people to kneel. He was so popular that people from throughout England moved to Saint Botolph's town just to hear him preach. Soon the influence of the Puritans and Separatists reached the ear of the King and an effort was made to silence them. It was during this time that the Puritans decided to move to the Massachusetts Bay Colony to practice their faith freely. With the financial backing of the Earl of Lincoln and the wealthy families of Saint Botolph's parish, in the spring of 1630 a flotilla of seven ships was ready to take the first wave of 1,000 emi­grants to a new colony in the New World. Members of Saint Botolph’s Church were prominent among those who set sail for Massachusetts Bay in April 1630, under their chosen leader John Winthrop on the Arbella, named for the daughter of the Earl of Lincoln, who was aboard with her husband. Their pastor, John Cotton, preached a farewell sermon just a few days before the small convoy sailed from Yarmouth. It is said that about 10% of the first settlers in Boston, Massachusetts came from Boston, England. Over the years, the old and new Bostons have kept in touch. St. Botolph’s Church was restored in the mid-1800's and again between 1929-33, both times with significant help from the people of Boston, Massachusetts. As it happens, the town offers unique hospitality for Americans as a result. In 1999 the Partnership of the Historic Bostons was formed to re-establish the relationship between Boston, Massachusetts, and its mother town in England, with committees on both sides of the Atlantic working to keep the connections alive. Every year in Boston, Massachusetts, Boston Charter Day celebrates the anniversary of Boston’s naming and creation as a political entity on September 7, 1630. Events are coordinated by the Partnership (www.historicbostons.com). Saint Botolph's Church began its construction in 1309 and completed in 1390. The church tower, famously known as Boston's Stump or The Stump, was erected in 1425 and took another 90 years to complete. It is the highest tower of any parish church in England at 272 feet built to navigate ships six miles away. It is of this tower with its beacon and its bells that we hear in Jean Ingelow's touching poem, "High Tide On the Coast of Lincoln­shire." Its construction was based on the calendar: 365 steps up the tower for days of the year, 12 stained glass windows for months of the year, 4 large main doors for the seasons, and 7 columns on the chancel roof for days of the week. 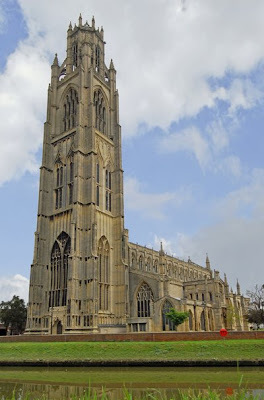 Today, Boston in Lincolnshire is a bustling market town of 36,000 and throughout the year of 2009 it is celebrating the 700th anniversary of Saint Botolph's Church with many festivities throughout the year. The people of Lincolnshire modeled many things in new Boston based on old Boston. On March 4, 1634 the Court of Assistants in new Boston, remembering the Stump of Saint Botolph's Church, passed the following resolution: "It is ordered that there shall be forth with a beacon set on the Centry hill at Boston to give notice to the Country of any danger, and that there shall be a ward of one person kept there from the first of April to the last of September; and that upon the discovery of any danger the beacon shall be fired, an alarm given, as also messengers presently sent by that town where the danger is discovered to all other towns within this jurisdiction." This also helps us to understand the significance of the light at Boston's Old North Church in today's North End that sparked the Revolutionary War and signaled the famous ride of Paul Revere. Nathaniel Hawthorne traveled to old Boston in Lincolnshire. He hints that the winding streets of new Boston can be attributed to old St. Botolph's town: "Its crooked streets and narrow lanes reminded me much of Hanover Street, Ann Street, and other portions of our American Boston. It is not unreasonable to suppose that the local habits and recollections of the first settlers may have had some influence on the physical character of the streets and houses in the New England metropolis; at any rate here is a similar intricacy of bewildering lanes and a number of old peaked and projecting storied dwellings, such as I used to see there in my boyish days. It is singular what a home feeling and sense of kindred I derived from this hereditary connection and fancied physiognomical resemblance between the old town and its well-grown daughter." Survives the sculptured walls and painted panes. That lies concentred in a single word. The Puritans who named their “city on a hill” Boston likely had no intention of naming the city after a canonized saint, merely naming it after where many of them came from. And while June 17th is a holiday in new Boston, it is not for Saint Botolph but for the battle fought on Bunker Hill on that day in 1775. Coincidentally, the feast day of Saint Patrick, Boston’s other patron saint due to its many Irish immigrants, is also a public holiday but that is due to Evacuation Day and not the Saint's day. - He was born into a Christian Saxon family in the early seventh century. Botolph and his brother Adolph were educated by Saint Fursey in Cnobersburg Monastery, located at Burgh Castle near Great Yarmouth. - When Mercian forces invaded the region, Botolph and Adolph went to Europe and became Benedictine monks in Belgian Gaul. Botolph returned to England in 647 to found a monastery in East Anglia based on the Benedictine Rule. He is credited for first bringing Benedictine monasticim to England. His brother Adolph, also commemorated on June 17th, remained in Germany or Holland and became a bishop. - On his return, Botolph approached the little known King of the southern Angles, Ethelmund, whose sisters he had known in Germany that were also monastics. The King offered Botolph part of the royal estate upon which to build a monastery. Botolph however had specifically asked for land not already in anyone’s possession so that his gain would not be another person’s loss. Instead he settled for a desolate, barren island, reported to be haunted by demons. We are told that he received threats and horrible apparitions by these marsh-demons and overcame them through prayer, fasting and erecting a large Cross. Thus, land haunted by demons became holy ground. - With the support of Saint Syre, Saint Aubierge, and their brother, King Anna of East Anglia (who may be the same King Ethelmund), Botolph founded the Monastery of Ikanhoe (Ox-island), which according to the Saxon Chronicle, was established in 654 AD as a Benedictine abbey. - The site was surrounded by water and endless work was needed to make this austere place viable. But Botolph attracted enough brother monks and hermits and soon, through their hard work and faith, the monastery grew. The monks built several structures, turned large areas of marsh and scrub into productive grazing and farm land, and dispelled the local people's fear of demons. - No one knows for sure today where Ikanhoe was - the two modern contenders are Iken in Suffolk and Boston in Lincolnshire. For many years local historians believed that the developing area around the monastery came to be called Botolph's Town, then Botolphston, with the name finally contracted to Boston. However, more recent research suggests that the actual spot may be the village of Iken, near Snape in east Suffolk which, centuries ago, was almost encircled by the River Alde. The church there is also dedicated to St. Botolph. - During his time at the monastary, Botolph also worked as a travelling missionary through the rough, bandit-plagued areas of East Anglia, Kent and Sussex. He was known for many wonders and healings and displayed a gift of prophecy. His biographer, the English monk and musician, Folcard, writing in the 11th century, describes him as "distinguished for his sweetness of disposition and affability." Even the prominent Anglo-Saxon monastic, St. Ceolfrid, who later brought to Rome the Codex Amiatinus, a manuscript of the oldest Vulgate text of the Bible, came to Ikenhoe to spend time with this man. - It is believed he died after a long painful illness while being carried to chapel for a compline service on 17 June 680 – the date his feast is commemorated. He was buried there at Ikanhoe. He was known to be "a man of remarkable life and learning, full of the grace of the Holy Spirit." His relics were later found incorrupt, and giving off a sweet fragrance. - Botolph is supposed to have been buried at his foundation of Ikanhoe. In 970 King Edgar gave permission for his relics to be transferred to Burgh, near Woodbridge where they remained for some 50 years before being transferred, on the instructions of Cnut, to their own tomb at the Abbey of Bury St Edmunds. His relics were later translated (with those of his brother Adolph) to Thorney Abbey, although his head was transferred to Ely and other portions to Westminster Abbey and other houses. December 1 is the Feast of the Translation of his relics. - Burgh is an ancient site, a hill top iron age settlement with signs of later Roman occupation. We know that in 970 the relics of Saint Botolph were housed in a chapel here and that he had a reputation for casting out demons. Burgh was known at that time as also being haunted by marsh-demons. There seems to be evidence that the hill in Beowulf, which was written in Suffolk in the 7th century, where Grendl was supposed to have lived, was this one. Was the story based on an older folk memory? The neighboring village is called Grundisburgh, consonant with the demon Grendl. 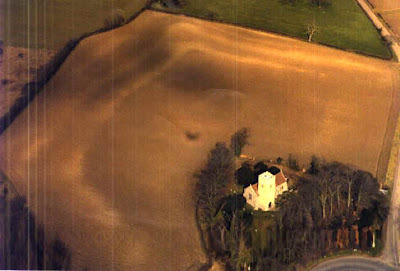 Burgh Church from the air looking northeast. The church overlooks the haunted marshes. 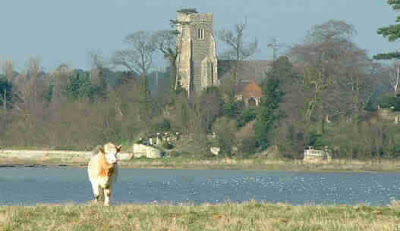 It is thought that Saint Botolph's relics were brought here so the locals could overcome their fear of the demons inhabited in the marshes. - Many churches between Yorkshire and Sussex are dedicated to Saint Botolph, with a heavy concentration in East Anglia. It is said there are 71 churches in total. They bear witness to his untiring missionary work which strengthened the Benedictine movement for many centuries after his lifetime. - Because he is considered the patron saint of travelers, four City of London churches, near gates in the City walls, were dedicated to him - St Botolph Billingsgate (destroyed in the Great Fire and never rebuilt), St Botolph Aldersgate, St Botolph-without-Bishopsgate (where the poet Keats was baptized) and St Botolph's Aldgate. This is attributed to providing places for incoming travelers to give thanks to him for safe arrival and for outgoing travelers to pray to him for a safe journey, and/or to relics of him coming through these four gates when King Edgar moved them from Iken to Westminster Abbey. - Since old Boston in Lincolnshire had originally been haunted by demons which were exorcised by Saint Botolph, this also became the model for Puritans in new Boston as well that unfortunately went too far in purifying the Massachusetts Bay Colony with their heresy and witch trials that resulted in many executions. For hymns in English to Saint Botolph written by Holy Transfiguration Monastery, see here and here. Neither the desolation of the fens, nor the depth of thy humility could hide the light of thy virtues, whereby thou becamest a lamp unto the faithful, O Botolph our venerable Father. Wherefore, we entreat thee: do thou also enlighten us who venerate thy blessed memory. The glory of the just, the protector of Boston, the man of mighty prayer, our belov'd Father Botolph, entreateth the Saviour that He show mercy to all of us. Let us honour him with thankful praise, O ye faithful; let us imitate his conversation and virtues, that God hear his prayers for us. Boston doth exult on this holy day, for thy deeds, O wise one, are gone up as most fragrant myrrh and sweet smelling incense before the throne of Christ God, O Botolph, our blest Father and teacher in all truth.